Setting up servers is not such a complicated task these days. Keeping track of utilization, performance, and potential maintenance issues is a lot more difficult. Greater complications arise when you expand your infrastructure to include a number of servers. You don’t want to get trapped into buying from one vendor and it may be advantageous to use a blend of operating systems in your network. SolarWinds Server and Application Monitor (SAM) (FREE TRIAL) – A server monitor that covers Dell PowerEdge servers, HP ProLiant servers, IBM eServer xSeries servers, Dell PowerEdge Blade racks, HP BladeSystem enclosures, Microsoft Windows Server, and VMware vSphere hypervisors. 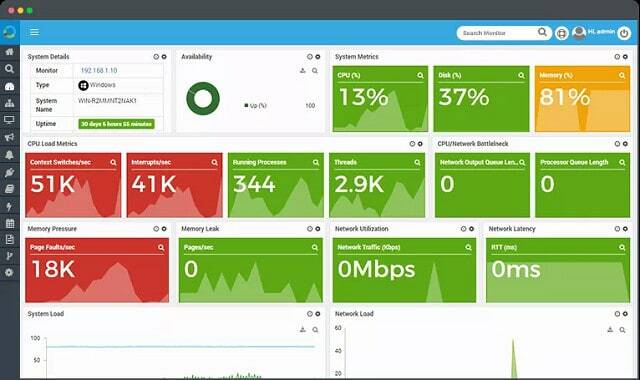 Paessler PRTG Network Monitor (FREE TRIAL) – This is a unified network, server, and application tool that monitors the CPU capacity, memory usage, disk status and performance, fan status, and power supply health of your servers. Server Density – This tool monitors onsite and Cloud-based servers; it covers Linux and Windows onsite servers and AWS, or Azure-based cloud servers. ManageEngine Applications Manager – This applications monitor also covers server health and gives live statuses on CPU utilization, disk performance and capacity, memory usage and I/O performance. Nagios XI – A network monitoring system that also covers applications and servers. You can opt for a free version, called Nagios Core. Icinga – This tool is an adaptation of Nagios Core and is free to use. Instrumental – This is an application monitor that also covers server statuses, specifically: CPU usage, disk status, load information, memory activity, network interaction, and page swapping events. 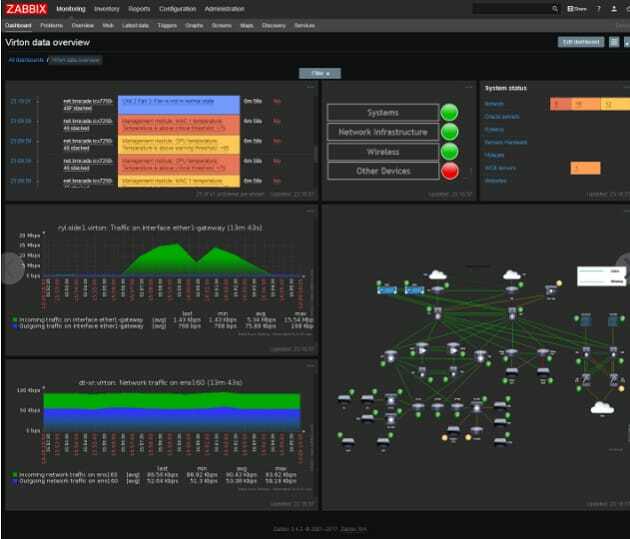 Zabbix – A free system monitor that tracks CPU operations, memory utilization, I/O error rates, disk space, fan status, temperature, and power supply performance on your servers. 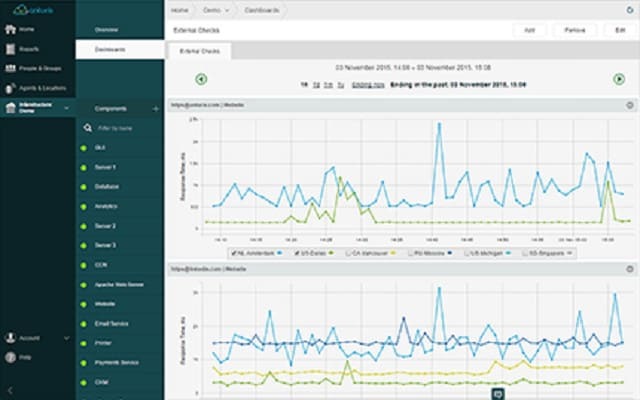 OP5 – A server monitor that enables capacity planning and trend analysis. Monitis – A cloud-based service that monitors applications and server statuses. Anturis – A cloud-based server monitor that tracks CPU, memory, disk usage, page swaps, power supply status, fan status, and temperature. Motadata – A network, server, and application monitoring tool that tracks disk volumes and spare capacity, CPU usage, and memory utilization. WhatsUp Gold – This tool monitors CPU activity, storage usage levels, and availability of memory on your server and will also track your network’s performance. Logging into each server in turn and manually checking performance is very time-consuming. This is why server management and monitoring tools have become so important. Remote server administration tools will enable you to manage servers on several sites and improve your efficiency. The term “server” is a blanket term that covers a wide range of operations. You could have a network-attached storage/file server, a web server, an application server, and an email server in your network. The key performance metrics that you need to keep control of in each of these cases are different. If you factor in cloud services, your web, mail, application and storage servers might all be offsite and in the ownership of another company. So, keeping track of all of the servers that you will end up with when they are in several different locations can be a nightmare. Getting a unified interface in order to monitor all of your servers from one location should be a priority. You have two main elements to watch on a server: the hardware and the software. You need a server monitoring tool that can give you live data on hardware performance, such as disk space, CPU and memory utilization, but you also need to see which processes are operating on the server and how many resources each process instance consumes. Although at least one member of the team will have the server monitor open all the time, you can’t really expect to dedicate human resources to have one person sitting looking at the server monitor dashboard around the clock. You need a server monitoring tool that combines routine collection of live data, with status assessment to provide alerts. Automated alerts will remove the need to chain someone to a desk. A system that includes the notification of alerts via SMS or email will make your job a whole lot easier. Keep on top of hardware utilization to head off performance issues. So, getting a view on real-time process volumes will give you the ability to predict and adjust your capacity requirements. Capacity planning takes you into server management issues. To better serve the company, its shareholders, and its customers, your server capacity should have some spare room to account for surges in demand, without being over provisioned, which would cause unnecessary expense. It is difficult to consider server requirements without also considering other equipment, such as your physical or virtual network, power supply, housing equipment, and staff availability. All the different variables that make your business unique mean that there is no single server management and monitoring package that is the best for every company out there. Hardware availability and location are important factors for a systems manager to keep an eye on. Software license expiration, patch management, and the prevention of unauthorized software installations are other server administration tasks that fall into the management role. The server management functions of a system administrators duties falls into the remit of senior staff. Many server monitoring and maintenance checks can be allocated to junior staff, or completely automated. So, depending on the size of your company and the size of your systems administration team, the ability to define user roles and limit access to system data will vary in importance. If you are a small business with very few servers and only one person in charge of managing them, you may only need one user role and one user account for your server monitoring tool. If you have a large team and need to allocate specialist tasks to each employee, then access management functions become a priority. Full management of your servers requires a range of server administration tools. If you need to engage in remote server administration, you will need to expand your management tools shopping list even further. Although you may be happy with your current hardware provider, it is probably a mistake to tie yourself into a monitoring system that is dependent on one manufacturer. So even if you already have all your equipment from one brand, create flexibility for the future to give yourself options. Try to fit the server management tool to your current server monitoring requirements. Although there are some very comprehensive server management packages out there, you shouldn’t be tempted to buy utilities that you are never going to use. If you have just a small system that you manage by yourself and buy a monitoring package that is tailored towards large team-managed systems, you may have to visit so many different screens to get so little information that you need that you end up abandoning the software. If you operate a small business, look for a cut down version of a big system manager package. This will enable you to upgrade the server monitoring tool as your company expands. If you buy a package from a company that only caters to small companies, you will have to switch providers at some point and learn how to do your job with a whole new monitoring tool. A tool that just shows you what your server is doing is not good enough. You need your server monitoring system to take care of routine server administration tasks automatically. In this instance, the human intervention of these tasks is reduced to checking the logs. Such a job creates a great training opportunity for an intern and frees up your time for more important tasks. Even if you are a sole system administrator, the ability to create roles to grant partial access to the dashboard of your server monitoring system can be very useful. Creating roles means you can grant report access to management staff and let them answer their own questions. Someday, you might take on an assistant, and you will need that junior help to get access to some part of the system, without getting at the controls of your management tool. No matter how well organized a server management tool is, you will always find that you wish you could move a column on a report, or switch out part of the data for another piece of information. Similarly, the ability to customize the dashboard to get your most important metrics in a prominent position is a time-saving necessity. Server management tools vendors are usually very open about the size of the company that their software is suitable for. Some vendors try to cater to everyone, but, ultimately, their software was written to work best for a specific size of the enterprise. You don’t want your monitoring system to slow down the server or generate too much network traffic. The only way you will really know whether a package is suitable for your business is to try it out. Fortunately, many vendors offer trial periods. With the above criteria in mind, we have put together a list of the ten best server management and monitoring tools on the market today. The list includes systems that are suitable for small businesses and others that are better for large corporations. You will read about on-premises software and also cloud solutions. 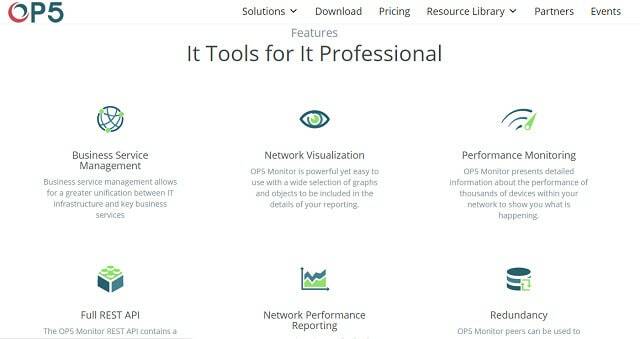 SolarWinds is a leading producer of IT infrastructure monitoring software. 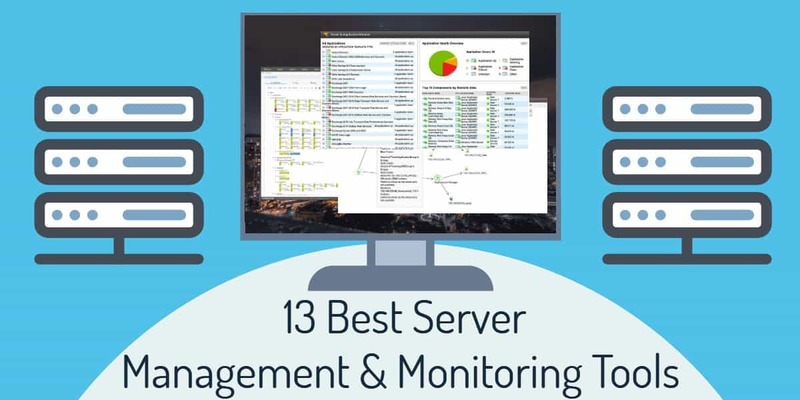 The Server and Application Monitor (SAM) can be linked together with the company’s Network Performance Monitor to create a truly comprehensive monitoring system for your business. However, this is a solution that is better suited to large corporations. You can centralize all of your server admin from several sites and also integrate cloud server performance. The SolarWinds SAM system can monitor AWS and Azure services and will cover storage, databases, and more than 1,200 applications as well as the health of your server hardware. The server hardware metrics that get monitored by the SolarWinds system include CPU usage, hard drive, array, power supply, and fan status. 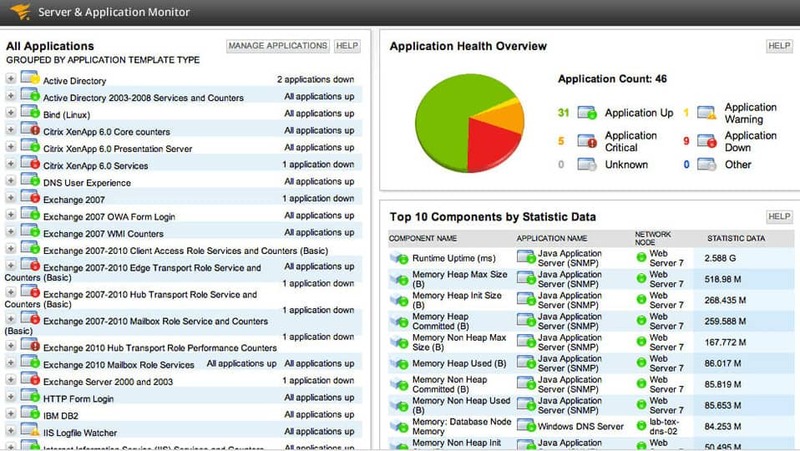 The application performance overview is color-coded with green signifying normal conditions and critical statuses highlighted in red. This representation makes the monitoring of performance very easy to perform. The monitoring software has an auto-discovery feature, which will identify your hardware and applications without any intervention from you. This feature is also a key attribute of the company’s network monitoring system. The dashboard includes a series of pre-written task templates that will help you automate your regular monitoring and preventative maintenance tasks. There are also pre-written reports and alerts built into the monitoring software. The Appstack utility helps you track down infrastructure utilization on an app by app basis. This will help you identify where surges in demand come from and help you plan your capacity better. That interdependency between software access and its supporting hardware also extends to network activity. For example, if you suddenly encounter problems with SQL Server, you need to pull in all of your server administration tools in order to fully troubleshoot the cause of that problem. You can customize the Dashboard, creating different views for different roles, which will enable you to delegate responsibility to junior team members. You can also customize reports and create your own automation routines and custom alerts. These functions make the SolarWinds SAM a really important server administration tool. Apart from the Network Performance Monitor, you can integrate this module with a network traffic analyzer, a network configuration manager, a storage monitor, and a virtualization monitor. The standard Server and Application Monitor includes virtualization manager functions to monitor Hyper-V and VMware ESX systems. One of the most fully-featured tools available, you can monitor both physical servers and those on cloud services like AWS and Azure. It automates as many tasks as possible, both identifying hardware and applications and using pre-written templates to automate regular tasks. Supporting over 1200 applications you can identify surges in demand on an app-by app basis. With a fully customizable dashboard for multiple roles, this is a hugely flexible tool. Paessler PRTG Network Monitor is a very comprehensive infrastructure monitoring system that even comes in a free version. The freeware option has a limit of 100 sensors, but otherwise contains all of the options presented by the paid system. This is one that small businesses have to be very careful about because the package includes so many features that you could end up spending all day playing around with it and not actually get any work done. So, choosing this option requires a lot of planning and discipline if you are just a small enterprise with very few facilities to monitor. The package includes network monitoring features and you could easily cover all of the infrastructure of your enterprise with PRTG. Really this is a package suited for very large corporations, but Paessler also produces price points that will tempt middle-sized companies. The Dashboard of PRTG is very attractive and includes dials, line graphs and charts to make status checks a speedy task. Hardware component monitoring covers CPU capacity, memory usage, disk status and performance, fan status, and power supply health. PRTG will become an essential component of your server administration tools. The server application monitor has specialized procedures for web servers, mail servers (including Exchange servers), database servers, and virtual servers. The PRTG system automatically discovers your entire infrastructure including servers, network, network equipment, terminal devices, cloud services, and virtual environments. This comprehensive approach enables the system to flow through the consequences of statuses in one part of your infrastructure and warn on the impact any changes will have on your server performance as well as examining the server’s health in real time. PRTG includes a Syslog receiver, which will gather Syslog messages and act as a Syslog server. The Paessler pricing model means you pay once for the software and keep the right to use it forever, however, you only get maintenance and support included for one year with your purchase. After that, you will need to pay for an annual maintenance contract in order to continue to qualify for patches and software upgrades. The free version of PRTG allows you to monitor 100 conditions, which the company refers to as sensors. The cheapest of the paid packages costs $1,600 and gives you the right to monitor 500 sensors. The top-of-the-range package would be suitable for very large businesses and costs $60,000. You can have a 30-day free trial of the full system with unlimited sensors. When it comes time to buy, you select which conditions you want to monitor across all infrastructure, including the network. If you are interested in just using the PRTG system to monitor your servers and applications, you would just group your sensor allowance around server-related factors. Server Density specializes in cloud server monitoring, but it also covers onsite servers. The monitor has special procedures to cover the activities of websites. The tool is offered by the StackPath group, which specializes in DDoS protection and web application firewalls, so you will be able to explore related products to protect your web server from attack. The console for the service is browser-based. This is an online service, so you don’t install the data interpreting software on your site. However, you do need to install a monitoring agent on each of the servers that you want covered by this tool. Those servers can be Linux, Windows, or AWS, or Azure-based cloud servers. The monitor will check on the routes to your servers with Ping. It will also keep track of disk volumes and available space, CPU utilization, memory usage, and web server performance. The dashboard contains headline blocks and graphs of live data. You can set alert conditions on any of the data that the agents gather. For example, you can set a threshold of CPU usage so that when processing demands become excessive, you will receive an alert. Those alerts are displayed on the dashboard and you can also get them sent to you as emails or SMS messages. System alerts can also be channeled to Slack, Webhook, and Pagerduty. The Server Density system includes APIs so you can integrate communication with the central server into your own programs. The console can be assigned to many users within your department and you can create user accounts that have access to all of the utilities in the dashboard, or just a limited view. This is great if you want to give partial access to junior team members, or create a reporting user account for a business manager. The “Software as a Service” model used for Server Density means that this tool is very easy to set up. You can get a 14-day free trial to give the system a walk through its paces. 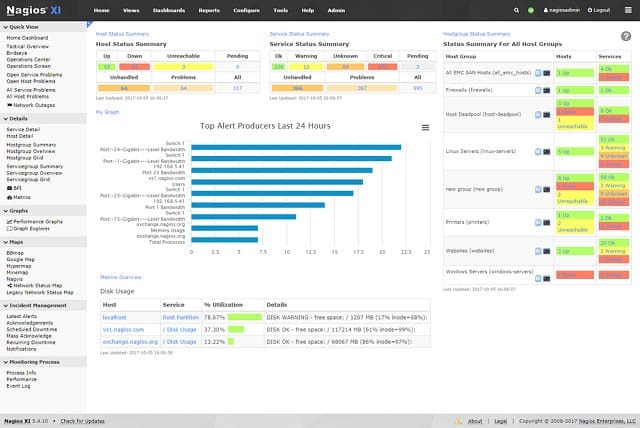 ManageEngine is another of the leading infrastructure monitor providers and its Applications Manager is well worth checking out for server monitoring. The company also produces the highly rated OpManager network performance monitor, which will integrate well with the Applications Manager to give you a full facilities monitoring suite. Line graphs provide the main graphical medium for displays. The attribute of your servers that get monitored live by this system include CPU utilization, disk performance and capacity, memory usage and I/O performance. Hardware factors shown in the monitor include power, fan, and temperature sensor readings. The applications that can be monitored on your servers include SQL Server, an ERP system, such as SAP, Oracle EBS, Microsoft Dynamics AX and CRM, and Siebel CRM. Mobile apps for iOS and Android, plus mobile web apps are also covered by applications monitor, as well as the regular services that your web and applications servers both use and deliver. The application management module of this package has some very interesting features to help you plan your capacity and test new apps. You can automate testing with workflows that can interact with recorded events from your server’s performance history. This means that you can get an idea of how a new application will impact your resources before you put it live. This gives the ManageEngine Application Manager the status of a server administration tool. Performance monitors check on the the availability of Active Directory services including those operating on your Exchange server. The speed of access to Active Directory and LDAP functions is also constantly monitored. The gtool also includes the monitoring of Syslog messages and event logs on Windows systems. The monitor is self-installing and doesn’t require you to access each server individually to perform setup. You get pre-written task templates and reports with this system and you can also produce your own automation scripts and custom reports. You can install the monitoring console on Windows and Linux operating systems. The entry price of ManageEngine’s Applications Manager is $945, which makes it one of the cheapest of the “bells and whistles” paid server monitors. You can get a 30-day free trial of Applications Monitor and it downloads directly from the ManageEngine website. Nagios XI is a very comprehensive infrastructure monitoring system that covers networks as well as servers. The Nagios system is based on an open source project called Nagios Core. Open source software is available to download as code. The idea behind this concept is that it prevents companies from hiding security breaches in compiled programs. It also means that developers around the world can create additional features. The Nagios Exchange is a forum where you can pick up plug-ins to enhance the basic Nagios system. The Exchange is a good place to pick up tips and opinions from other server managers. You can gather opinion on alternative free systems, such as Microsoft’s RSAT, get tips on remote server administration tools, and other useful software — you don’t have to just talk about Nagios. The Nagios Core interface is very basic, and Nagios XI was created for those who want more functionality. The Nagios XI dashboard is customizable and you can create different views on data and access levels to controls that will enable you to delegate work to junior staff safely and give reporting access to management and customers. The system set up procedure is made simpler by a configuration wizard, which will do most of the work for you. When you buy the Nagios software, you get support for the first year. Although your purchase gives you the right to use Nagios XI forever, you will need to pay extra for an annual support contract once the initial free year of support expires. Nagios Core implementers and the users of the free Nagios XI have to rely on community forums for assistance. The graphics in the Dashboard make key metrics and statuses easy to recognize and include predictive and data analysis tools for capacity planning. Failure statuses generate alerts in the Dashboard. Notifications of alter conditions can be sent out to key staff as SMS messages or emails. There are three price points for Nagios XI and the cheapest of these is free. The free version is limited to monitoring seven network nodes, but you can set which points on your network you wish to monitor and use up that allowance with your servers. It would be more advantageous to combine server monitoring with network monitoring to ensure that the entire environment is covered by the same monitoring tool. The lowest level of paid Nagios XI gives you the right to monitor 100 nodes, which is quite a step up from just seven. Icinga was originally created as a variation on the open source Nagios Core code. The Icinga project is also open source, which means that you can use it for free. There are three different interfaces available with Icinga. Incinga Core can be used with the Icinga Classic Dashboard or the Icinga Web interface. A more sophisticated version of the system is called Icinga 2 and that has its own Dashboard layout, called Icinga Web 2. The basic Icinga 2 download gives you the monitoring engine that will cover your network and your servers. You can choose to visualize that data with your favorite apps, or download the Incinga 2 Web front end. The Dashboard is fully customizable, enabling you to rearrange the standard widgets that come with the Incinga Web 2 download and also add in other plug-ins developed by the Incinga community. You can create different user types and assign limited Dashboard views to them, including reporting-only access for customers and management. History logs help you compile data for analysis and capacity planning. The system comes with a command-line interface, which enables you to write your own scripts to manipulate and transfer data for analysis. Alerts are central to the system and keep you abreast of critical conditions. You can nominate different users to be notified in specific error conditions and those notifications are available via SMS, mobile messaging, or email, so you don’t have to be at your desk to get system status alerts. Icinga 2 is completely free of charge. However, it is better suited to companies that have a system programmer to hand or small businesses that have a scripting enthusiast running the network and administering the servers. This system is great for those who want to create a customized server and network monitoring system. If coding is not your forte, you will struggle to get the best out of Icinga. You can watch the response times of applications, such as SQL server or WebDAV, on your server in real time and then use the drill-down capabilities to look at the activities of underlying services and server features. This enables you to plan capacity for peak loads and distribute work more evenly across your application servers. 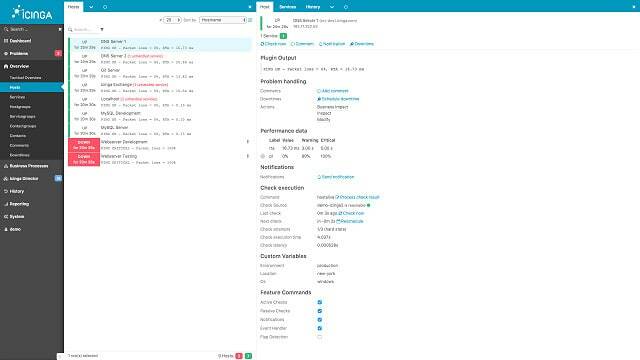 A query language within the Dashboard enables you to create on-the-fly investigations and also create customized reports. The Instrumental Query language can also be used to create custom alert conditions. Those alerts can be sent to you by SMS. Each page view and graphic can be sent to a correspondent as a URL, enabling you to give limited views on data to customers and managers. Access to the Dashboard is controlled by user accounts and each user can be allotted projects, which limits the access to system data and controls for each team member. This package would be ideal for a company that is centered on a web application or commercial website. The company offers a great option to single site operators because you can use the software for free up to 500 metrics. Each piece of collected data is available for view and aggregation for three hours with this free service. The next level up from the free app is the Production package. This costs 10 cents per metric per month and is a good option for small businesses. Typically, Instrumental customers with this package spend about $5 per month for the service. The data collected with this service is available for 13 months. The top package offers unlimited metrics and is priced by negotiation. Zabbix is a free-to-use open-source package. The monitor functions of the system include network and application status checks as well as server monitoring. The monitor can operate on IBM, Linux, Lenovo, Dell, and Solaris systems. The monitor also keeps track of software, operating system, and firmware statuses for the server and all other devices connected to the network. This includes configuration control and checks for unauthorized installs or version changes. Operations are conducted through procedural outlines, called templates. 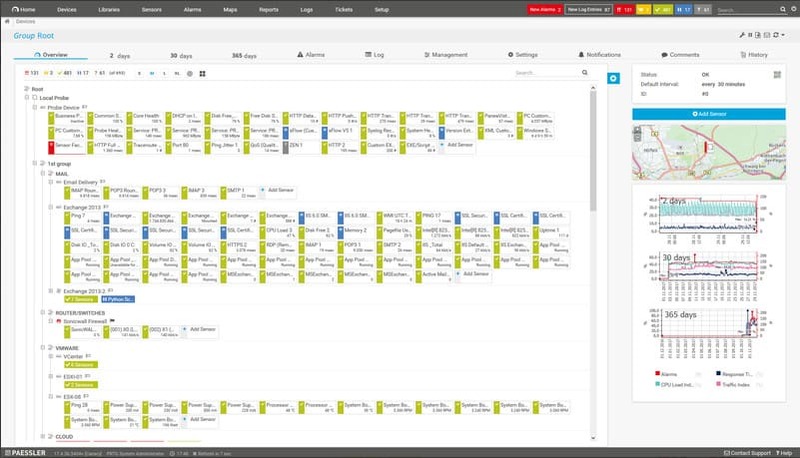 You can use templates that are pre-written by the Zabbix team, pick up the templates created by other implementers of Zabbix in the user community, or create your own custom templates. You can also create custom alerts and adjust the severity rating of existing warnings to blend the right levels of critical statuses for your server and network. The alerts generated by the system can be sent to you by SMS, messenger app, or email. The system enables you to set up different users for the dashboard with varying permissions and alerts can be directed to specific users. It is also possible to create automation scripts and set up workflows to assign tasks and alert responses. You can monitor across sites from one central location safely because all Zabbix messages are encrypted for protection. The package also includes a remote access facility to enable you to contact devices on other sites directly from your central command center. So, this is a good remote server administration tool. This system might take too much time for a sole systems administrator monitoring a small network to set up. The extensive messaging and encryption procedures can make the system slow to respond where then are more than 1,000 nodes to watch, so this system is best suited to monitoring the networks of middle-sized companies. 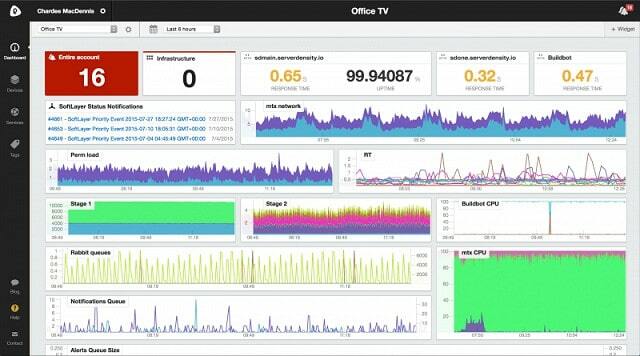 OP5’s server monitoring system enables capacity planning and trend analysis as well as the regular functions that you would expect from a server monitoring package. The company also produces network monitoring software, so you can combine the two packages to get complete infrastructure control. The company states that its software is able to monitor all brands of server hardware and any operating system. You can keep track of physical attributes such as CPU usage, memory activity, disk space, I/O performance, power supply status, and fan availability. Virtual networks and cloud services can be monitored by this system and multi-site implementations do not present a problem. Apart from the display of live performance data, the server monitor includes alerts to warn of critical and unexpected failure conditions. Analysis features include the typical response times for standard user activities on your server. You can examine the performance of applications and services and identify which resources in your IT system cause bottlenecks under a range of usage scenarios. A very nice feature is an intelligent load balancer that is able to adapt to varying demand and allocate requests to underutilized servers in your cluster. OP5 is a server administration tool as well as an infrastructure monitor. This server and network monitoring system is suitable for middle-sized companies and large corporations. The user interface of the monitor features graphical visualizations and access to data can be partitioned according to nominated user account access rights. This makes the OP5 system a great choice for a team of system administrators. Although the platform behind OP5 is open source, there isn’t a free version of this monitoring system. The company isn’t open about its prices. It will give you a tailored quote once you enquire. The pricing structure is based on the number of devices that you want to monitor and negotiations that take place after you send in for a quote. You can access the software for a 30-day free trial to make sure it does everything you need from a server monitor before you have to pay. Monitis is a cloud service so you would benefit from this option if you don’t have onsite expertise and you don’t want to have to install any special software on your system. This monitoring package is particularly aimed at web servers and includes application monitoring along with checks on the physical status of your server. You can keep track of all of your IT services for the delivery of your online business from your web server software, SQL Server, and your email system though to the physical properties of your servers. Your server status can be viewed at the system dashboard, which can be displayed in any web browser. The company claims that it takes about three minutes to get the monitoring system operating on your server. The dashboard can be customized and the attributes of your server that are monitored by Monitis can be extended by plug-ins. The dashboard is attractive and easy to follow thanks to visualizations that include dials, charts and graphs. You get to see live data on your server’s performance plus alerts that notify of unexpected error conditions should they arise. The carry out data is stored for two years, and then enables you to perform full analysis of the server’s performance. You can set up user accounts to access your server monitor and create roles that limit the views that each user type can get to. Reports can be shared by sending out emails with links to relevant data. This is a much easier way to deliver reports to manager and enables them to receive information represented in a blend of graphical formats, not just tables of records. The pricing structure of Monitis is a pay-as-you-go format with influencers including the number of servers and the number of users that you want to monitor each month. You get a 20 percent discount if you sign up for the annual plan. However, that scenario supposes that your monitoring volume will remain the same all through the year. The pay-as-you-go model is a very interesting proposition for cash-strapped start ups. However, you will need to keep adjusting your plan rate if you don’t have any historical records on transaction throughput when you sign up for the plan. You can take a 15-day free trial of Monitis to get a feel for the system before you buy. Anturis is another cloud-based option for your server monitoring needs. The company has a lot of price points depending on the number of factors that you want to monitor. Some companies call these factors “sensors,” but Anturis refers to them as “monitors.” A monitor is a topic such as CPU utilization or and HTTP transaction count. The great news about the entry level of this monitoring system is that it is free to use. This free version is only available for five monitors, which may be difficult to stick to, given that the typical physical factors that most server owners need to watch are CPU, memory, disk usage, page swaps, power supply status, fan status, and temperature — which totals seven factors. The cheapest paid service of Anturis gives you 10 monitors for $10 per month. Price points march up in units of ten with each monitor costing one dollar more each month up to the package that gives you 60 monitors. Then the monitor ratio gets cheaper and climbs all the way up to a package of 1,000 monitors for $650 per month. The Anturis system can monitor any server that runs Windows or Linux and it can also keep track of your cloud servers, such as AWS, Azure, and Rackspace. You can also track the performance of services and processes with the server monitor. Anturis can also monitor networks and applications. The decision is yours on where the monitors are located on your system. The pricing doesn’t affect the subject of monitors, just their quantity. As well as regularly cycling live data to the dashboard, your monitors will send out alerts if between-time failure occurs. Alerts can be forwarded to you by email for no cost. You also get a pick of phone call and SMS notification with your subscription. However, that quota can quickly run out. You can pay for extra phone and SMS notification capacity. Anturis offers a free trial for 30 days, which does not limit the number of monitors that you use. Once the free trial period ends, you can either strip out all of the monitors except for five and keep using the system for free, or keep with your higher number of monitors and pay for the service. The free trial gives you a good opportunity to work out how many monitors you need and so then you can decide whether the price you will have to pay makes the Anturis competitive with the other options that you have on your list. Motadata from Mindarray Systems is a unified infrastructure management and monitoring tool. Motadata Infrastructure Intelligence Platform (IIP) includes network, server, and application monitoring with specialized modules that track the performance of databases, cloud services, and web platforms. If the server you want to monitor supports an online business, you would be particularly interested in the URL and database monitoring activities of this suite. It will check on the availability of your web pages and also assess the delivery performance of your entire infrastructure to ensure that visitors to your website have an acceptable user experience. The specific server metrics that are observed by Motadata’s server monitoring module cover the regular physical characteristics of your servers including disk volumes and spare capacity, CPU usage, and memory utilization. The monitor also covers bandwidth capacity on your servers’ interfaces. The monitor integrates a log analyzer to catch events that may damage the capacity of your servers. 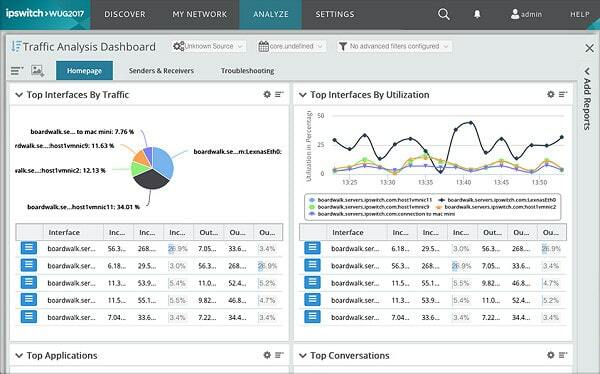 Server performance metrics interact with data sourced from the network and application performance modules to give you a stack view of your infrastructure, enabling you to spot the cause of performance issues. These can be actually server-related, or due to the underlying services and networks. The combination of data from monitoring modules also helps you watch capacity limits and plan for expansion of the right level of your hardware inventory to prevent performance limits impacting on the quality of your service delivery. Motadata is capable of monitoring both Windows and Linux servers and it is able to integrate remote servers into centralized WAN monitoring. All level of infrastructure monitoring is also available for cloud services, so if you contract in Software as a Service (SaaS), or just cloud storage, you can cover those remote resources with a centralized monitor. If you blend on-premises and cloud facilities, all of those resources can be managed by the unified monitoring system. The dashboard is attractive and crowded, squeezing in a lot of information through headline blocks, graphs, and charts. The server monitor has specialized sections for specific server types – email, database, application, and VM support servers. Motadata installs on Linux and the front-end is browser-based, so it requires a Gnome environment. You can get a 30-day free trial in order to assess the software. WhatsUp Gold, produced by Ipswitch, is primarily a network monitoring system. However, it’s hardware status tracking functions extend to server management. The company produces a number of add-ons that extend server monitoring capabilities to provide virtual environment monitoring and application management. The network monitor specifically checks on the health of the devices connected to the network rather than the performance of the network itself — that function is taken care of by the Network Traffic Analysis add-on. 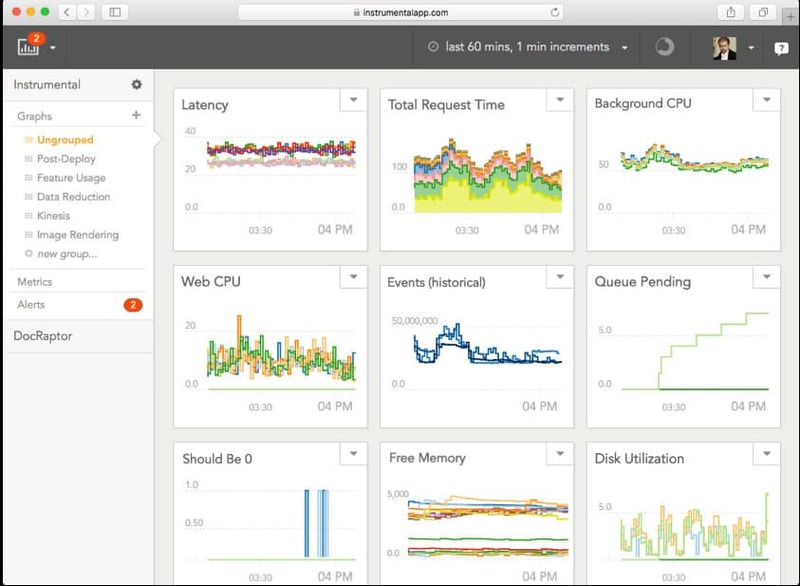 WhatsUp Gold details the status of each server with utilization metrics like CPU activity, storage usage levels, and memory availability. The tool begins its service life by exploring the network and logging all of the devices connected to it. This phase includes all servers on the inventory list. 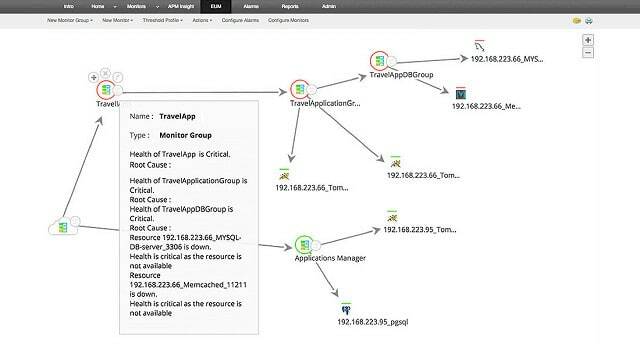 The discovery function creates a visual network map, so you can see all of the other devices connected to your servers. The standard WhatsUp Gold package includes Cloud and storage monitoring, so you can include off-site servers and file servers in your monitoring capabilities. Obviously, that extends to off-site storage facilities as well. These functions make WhatsUp Gold an essential service for people who need remote server administration tools. The Cloud server monitoring system included in the standard WhatsUp Gold package maps all in-house devices and endpoints currently connected to the Cloud servers you subscribe to. This is a live map, so you will see each connection as it is established, and they will disappear from the map at the end of the session. The system can detect connections to any type of remote server, but it is can show extensive metrics for AWS and Azure servers. The dashboard for the system is completely customizable. You decide which of the many available status monitoring metrics appear in the main screen and whether each is displayed as a list or chart. That customization also enables you to create separate interfaces for different roles in your team. Alerts on warning and critical conditions can be customized and directed to different team members as emails, SMS messages, or Slack notifications. The Virtualization Monitoring module provides detailed information about your VM system. The add-on can track activities under VMWare and Hyper-V systems. It can generate a visual map of your VM system and help you migrate hardware over to a virtual environment. The module creates real-time status reports on the CPU, memory, and disk utilization of your VM servers. The interface activity feed details the traffic that each VM generates. The Application Performance Monitoring add-on tells you more about the activities on your application servers. The module covers virtual environment systems, giving a deeper view of the activities of your VM system. The Application Performance Monitor tracks database management systems, such as SQL Server; web server software, including Apache; mail servers, and DNS services. It covers your system services as well as application software accessed by your users. The standard package, which is actually called “Premium,” includes the Cloud and Storage Monitor, but not the Application Performance Monitor or the Virtualization Monitor. You can buy these two modules individually, or opt for the Systems Admin Bundle, which packages together WhatsUp Gold Premium with the Virtualization Monitor and the Application Performance Monitor. If you need even more functionality, you could buy WhatsUp Gold Total, which includes all of the available add-ons. The other modules you get in this package are Network Traffic Analysis, Configuration Management, and Scalability Pollers. WhatsUp Gold runs on the Windows Server operating system. You can ask for a free trial. Server monitoring is an essential task. However, you don’t necessarily need to spend a lot of money to get some really good metrics. Combining server monitoring with application and network monitoring gives you a lot more control over your service than server monitoring alone can deliver. The basics of server monitoring just gives you the status of various hardware components, such as disk space and CPU utilization. Although you need to keep on top of these factors, they don’t necessarily illuminate the user experience that your customers are getting from your system. If you just focus your monitoring on your server’s status, you overlook complicating factors such as the network performance, or the availability of cloud services that contribute to your presentation. Performance monitoring is a very broad topic and you can get a better idea of all of the tasks involved in keeping your infrastructure in good shape by looking into complete systems that take care of your entire IT system. No matter how much reading you do on your quest to find the right server monitor, you won’t really get a proper feel from any system until you try it out. Fortunately, a lot of the systems on our list offer free versions for you to take a look at. Those that only offer paid solutions give you a free trial. These trial offers are essential if you are going to truly assess each candidate for your server monitoring needs. Although it may seem like a waste of time to try one system, tear it down, and then install a different monitor, it is better to go through the process of trying out a couple of options just to make sure you choose the right one. Thanks for the tip. I looked into Motadata and I added it to the list, thanks to your suggestion. Thanks for the tip, Adam. I will look into it.